Printed for the EBSN Conference in Tangiers. 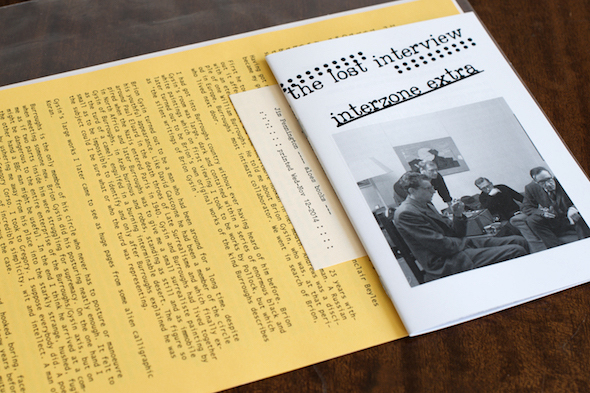 Unpublished transcript of an unbroadcast interview with William Burroughs, Clancy Sigal and Patrick Bowles arranged in 1960 by Melville Hardiment, including transcript of a lost Burroughs tape played before the interview (Nova Express work-in-progress and a Rimbaud cut-up), with an unpublished memoir by Melville Hardiment, describing his contact with Burroughs in the UK and the Paris scene c. 1960, including trips around the country and the attending a lecture by the neurophysiologist and robotician Dr W. Grey Walter in London. Photographs by Harriet Crowder.